Today’s tutorial kicks off a new series of blog posts on object tracking, arguably one of the most requested topics here on PyImageSearch. Furthermore, object tracking allows us to apply a unique ID to each tracked object, making it possible for us to count unique objects in a video. Object tracking is paramount to building a person counter (which we’ll do later in this series). This is a tall order for any computer vision or image processing algorithm and there are a variety of tricks we can play to help improve our object trackers. But before we can build such a robust method we first need to study the fundamentals of object tracking. 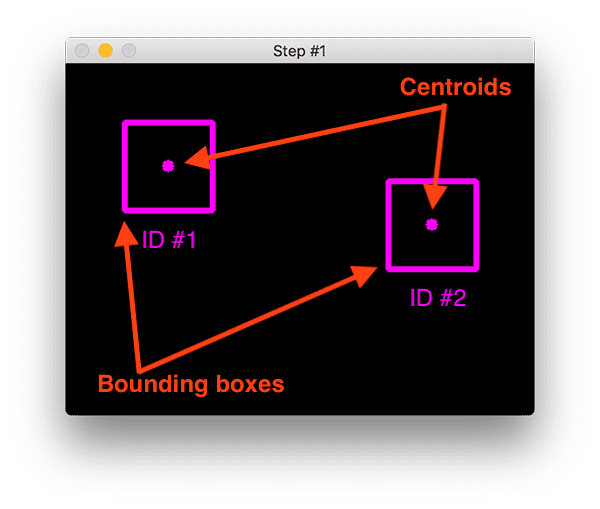 In today’s blog post, you will learn how to implement centroid tracking with OpenCV, an easy to understand, yet highly effective tracking algorithm. In future posts in this object tracking series, I’ll start going into more advanced kernel-based and correlation-based tracking algorithms. To learn how to get started building your first object tracking with OpenCV, just keep reading! In the remainder of this post, we’ll be implementing a simple object tracking algorithm using the OpenCV library. This object tracking algorithm is called centroid tracking as it relies on the Euclidean distance between (1) existing object centroids (i.e., objects the centroid tracker has already seen before) and (2) new object centroids between subsequent frames in a video. We’ll review the centroid algorithm in more depth in the following section. From there we’ll implement a Python class to contain our centroid tracking algorithm and then create a Python script to actually run the object tracker and apply it to input videos. Finally, we’ll run our object tracker and examine the results, noting both the positives and the drawbacks of the algorithm. 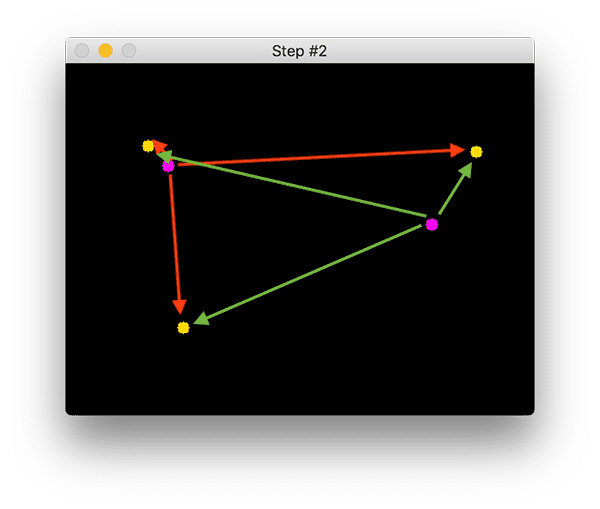 The centroid tracking algorithm is a multi-step process. We will review each of the tracking steps in this section. Figure 1: To build a simple object tracking algorithm using centroid tracking, the first step is to accept bounding box coordinates from an object detector and use them to compute centroids. The centroid tracking algorithm assumes that we are passing in a set of bounding box (x, y)-coordinates for each detected object in every single frame. These bounding boxes can be produced by any type of object detector you would like (color thresholding + contour extraction, Haar cascades, HOG + Linear SVM, SSDs, Faster R-CNNs, etc. ), provided that they are computed for every frame in the video. Once we have the bounding box coordinates we must compute the “centroid”, or more simply, the center (x, y)-coordinates of the bounding box. Figure 1 above demonstrates accepting a set of bounding box coordinates and computing the centroid. 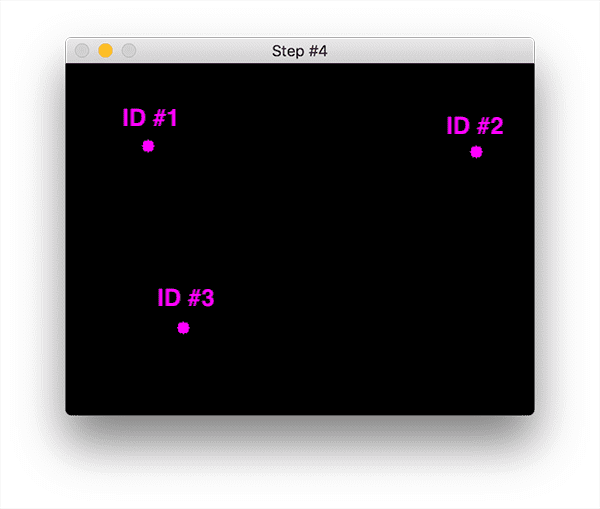 Since these are the first initial set of bounding boxes presented to our algorithm we will assign them unique IDs. Figure 2: Three objects are present in this image for simple object tracking with Python and OpenCV. We need to compute the Euclidean distances between each pair of original centroids (red) and new centroids (green). For every subsequent frame in our video stream we apply Step #1 of computing object centroids; however, instead of assigning a new unique ID to each detected object (which would defeat the purpose of object tracking), we first need to determine if we can associate the new object centroids (yellow) with the old object centroids (purple). To accomplish this process, we compute the Euclidean distance (highlighted with green arrows) between each pair of existing object centroids and input object centroids. From Figure 2 you can see that we have this time detected three objects in our image. The two pairs that are close together are two existing objects. We then compute the Euclidean distances between each pair of original centroids (yellow) and new centroids (purple). But how do we use the Euclidean distances between these points to actually match them and associate them? The answer is in Step #3. 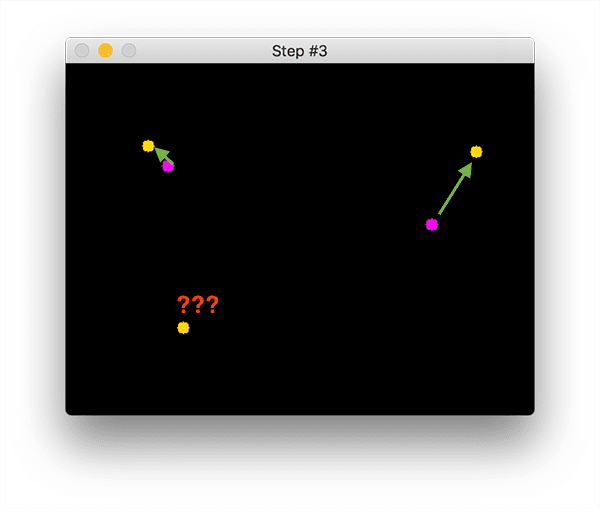 Figure 3: Our simple centroid object tracking method has associated objects with minimized object distances. What do we do about the object in the bottom left though? The primary assumption of the centroid tracking algorithm is that a given object will potentially move in between subsequent frames, but the distance between the centroids for frames and will be smaller than all other distances between objects. Therefore, if we choose to associate centroids with minimum distances between subsequent frames we can build our object tracker. In Figure 3 you can see how our centroid tracker algorithm chooses to associate centroids that minimize their respective Euclidean distances. But what about the lonely point in the bottom-left? It didn’t get associated with anything — what do we do with it? Figure 4: In our object tracking with Python and OpenCV example, we have a new object that wasn’t matched with an existing object, so it is registered as object ID #3. We can then go back to Step #2 and repeat the pipeline of steps for every frame in our video stream. Figure 4 demonstrates the process of using the minimum Euclidean distances to associate existing object IDs and then registering a new object. Any reasonable object tracking algorithm needs to be able to handle when an object has been lost, disappeared, or left the field of view. Exactly how you handle these situations is really dependent on where your object tracker is meant to be deployed, but for this implementation, we will deregister old objects when they cannot be matched to any existing objects for a total of N subsequent frames. Our pyimagesearch module is not pip-installable — it is included with today’s “Downloads” (which you’ll find at the bottom of this post). Inside you’ll find the centroidtracker.py file which contains the CentroidTracker class. The CentroidTracker class is an important component used in the object_tracker.py driver script. The remaining .prototxt and .caffemodel files are part of the OpenCV deep learning face detector. They are necessary for today’s face detection + tracking method, but you could easily use another form of detection (more on that later). …in addition to having OpenCV 3.3+ installed. If you follow one of my OpenCV install tutorials, be sure to replace the tail end of the wget command to grab at least OpenCV 3.3 (and update the paths in the CMake command). You’ll need 3.3+ to ensure you have the DNN module. Before we can apply object tracking to our input video streams, we first need to implement the centroid tracking algorithm. While you’re digesting this centroid tracker script, just keep in mind Steps 1-5 above and review the steps as necessary. As you’ll see, the translation of steps to code requires quite a bit of thought, and while we perform all steps, they aren’t linear due to the nature of our various data structures and code constructs. This process will bring everything full circle and allow you to wrap your head around the algorithm. On Lines 2-4 we import our required packages and modules — distance , OrderedDict , and numpy . Our CentroidTracker class is defined on Line 6. The constructor accepts a single parameter, the maximum number of consecutive frames a given object has to be lost/disappeared for until we remove it from our tracker (Line 7). nextObjectID : A counter used to assign unique IDs to each object (Line 12). In the case that an object leaves the frame and does not come back for maxDisappeared frames, a new (next) object ID would be assigned. objects : A dictionary that utilizes the object ID as the key and the centroid (x, y)-coordinates as the value (Line 13). disappeared : Maintains number of consecutive frames (value) a particular object ID (key) has been marked as “lost”for (Line 14). maxDisappeared : The number of consecutive frames an object is allowed to be marked as “lost/disappeared” until we deregister the object. The register method is defined on Line 21. It accepts a centroid and then adds it to the objects dictionary using the next available object ID. The number of times an object has disappeared is initialized to 0 in the disappeared dictionary (Line 25). Finally, we increment the nextObjectID so that if a new object comes into view, it will be associated with a unique ID (Line 26). Just like we can add new objects to our tracker, we also need the ability to remove old ones that have been lost or disappeared from our the input frames themselves. The deregister method is defined on Line 28. It simply deletes the objectID in both the objects and disappeared dictionaries, respectively (Lines 31 and 32). The update method, defined on Line 34, accepts a list of bounding box rectangles, presumably from an object detector (Haar cascade, HOG + Linear SVM, SSD, Faster R-CNN, etc.). The format of the rects parameter is assumed to be a tuple with this structure: (startX, startY, endX, endY) . If there are no detections, we’ll loop over all object IDs and increment their disappeared count (Lines 37-41). We’ll also check if we have reached the maximum number of consecutive frames a given object has been marked as missing. If that is the case we need to remove it from our tracking systems (Lines 46 and 47). Since there is no tracking info to update, we go ahead and return early on Line 51. On Line 54 we’ll initialize a NumPy array to store the centroids for each rect . Then, we loop over bounding box rectangles (Line 57) and compute the centroid and store it in the inputCentroids list (Lines 59-61). The updates to existing tracked objects take place beginning at the else on Line 72. The goal is to track the objects and to maintain correct object IDs — this process is accomplished by computing the Euclidean distances between all pairs of objectCentroids and inputCentroids , followed by associating object IDs that minimize the Euclidean distance. Grab objectIDs and objectCentroid values (Lines 74 and 75). Compute the distance between each pair of existing object centroids and new input centroids (Line 81). The output NumPy array shape of our distance map D will be (# of object centroids, # of input centroids) . To perform the matching we must (1) Find the smallest value in each row, and (2) Sort the row indexes based on the minimum values (Line 88). We perform a very similar process on the columns, finding the smallest value in each column, and then sorting them based on the ordered rows (Line 93). Our goal is to have the index values with the smallest corresponding distance at the front of the lists. Initialize two sets to determine which row and column indexes we have already used (Lines 98 and 99). Keep in mind that a set is similar to a list but it contains only unique values. If we’ve already used either this row or column index, ignore it and continue to loop (Lines 107 and 108). So we must determine which centroid indexes we haven’t examined yet and store them in two new convenient sets ( unusedRows and unusedCols ) on Lines 124 and 125. # frames the object has been marked "disappeared"
We need to verify if any of these objects are lost or have disappeared by looping over unused row indexes if any (Line 133). 1. Increment their disappeared count in the dictionary (Line 137). 2. Check if the disappeared count exceeds the maxDisappeared threshold (Line 142), and, if so we’ll deregister the object (Line 143). We loop over the unusedCols indexes (Line 149) and we register each new centroid (Line 150). Finally, we’ll return the set of trackable objects to the calling method (Line 153). Our centroid tracking implementation was quite long, and admittedly, the most confusing aspect of the algorithm is Lines 81-93. Once you’ve started a Python shell in your terminal with the python command, import distance and numpy as shown on Lines 1 and 2). Then, set a seed for reproducibility (Line 3) and generate 2 (random) existing objectCentroids (Line 4) and 3 inputCentroids (Line 5). From there, compute the Euclidean distance between the pairs (Line 6) and display the results (Lines 7-9). The result is a matrix D of distances with two rows (# of existing object centroids) and three columns (# of new input centroids). First, we find the minimum value for each row, allowing us to figure out which existing object is closest to the new input centroid (Lines 10 and 11). By then sorting on these values (Line 12) we can obtain the indexes of these rows (Lines 13 and 14). In this case, the second row (index 1 ) has the smallest value and then the first row (index 0 ) has the next smallest value. …we first examine the values in the columns and find the index of the value with the smallest column (Lines 15 and 16). We then sort these values using our existing rows (Lines 17-19). The final step is to combine them using zip (Lines 20). The resulting list is printed on Line 21. D[1, 2] has the smallest Euclidean distance implying that the second existing object will be matched against the third input centroid. And D[0, 1] has the next smallest Euclidean distance which implies that the first existing object will be matched against the second input centroid. I’d like to reiterate here that now that you’ve reviewed the code, you should go back and review the steps to the algorithm in the previous section. From there you’ll be able to associate the code with the more linear steps outlined here. Now that we have implemented our CentroidTracker class, let’s put it to work with an object tracking driver script. The driver script is where you can use your own preferred object detector, provided that it produces a set of bounding boxes. This could be a Haar Cascade, HOG + Linear SVM, YOLO, SSD, Faster R-CNN, etc. For this example script, I’m making use of OpenCV’s deep learning face detector, but feel free to make your own version of the script which implements a different detector. First, we specify our imports. Most notably we’re using the CentroidTracker class that we just reviewed. We’re also going to use VideoStream from imutils and OpenCV. --prototxt : The path to the Caffe “deploy” prototxt. --model : The path to the pre-trained model models. --confidence : Our probability threshold to filter weak detections. I found that a default value of 0.5 is sufficient. The prototxt and model files come from OpenCV’s repository and I’m including them in the “Downloads” for your convenience. Note: In case you missed it at the start of this section, I’ll repeat that you can use any detector you wish. As an example, we’re using a deep learning face detector which produces bounding boxes. Feel free to experiment with other detectors, just be sure that you have capable hardware to keep up with the more complex ones (some may run best with a GPU, but today’s face detector can easily run on a CPU). Instantiate our CentroidTracker , ct (Line 21). Recall from the explanation in the previous section that this object has three methods: (1) register , (2) deregister , and (3) update . We’re only going to use the update method as it will register and deregister objects automatically. We also initialize H and W (our frame dimensions) to None (Line 22). Load our serialized deep learning face detector model from disk using OpenCV’s DNN module (Line 26). Start our VideoStream , vs (Line 30). With vs handy, we’ll be able to capture frames from our camera in our next while loop. We’ll allow our camera 2.0 seconds to warm up (Line 31). We loop over frames and resize them to a fixed width (while preserving aspect ratio) on Lines 34-47. Our frame dimensions are grabbed as needed (Lines 40 and 41). Then we pass the frame through the CNN object detector to obtain predictions and object locations (Lines 46-49). We initialize a list of rects , our bounding box rectangles on Line 50. The ct.update call on Line 70 handles the heavy lifting in our simple object tracker with Python and OpenCV script. We would be done here and ready to loop back to the top if we didn’t care about visualization. On Lines 73-79 we display the centroid as a filled in circle and the unique object ID number text. Now we’ll be able to visualize the results and check to see if our CentroidTracker properly keeps track of our objects by associating the correct IDs with the objects in the video stream. We’ll display the frame on Line 82 until the quit key (“q”) has been pressed (Lines 83-87). If the quit key is pressed, we simply break and perform cleanup (Lines 87-91). Notice how I even though the second face is “lost” once I move the book cover outside the view of the camera, our object tracking is able to pick the face back up again when it comes into view. If the face had existed outside the field of view for more than 50 frames, the object would have been deregistered. Again, despite object ID #2 being unsuccessfully detected between some frames, our object tracking algorithm is able to find it again and associate it with its original centroid. While our centroid tracker worked great in this example, there are two primary drawbacks of this object tracking algorithm. The first is that it requires that object detection step to be run on every frame of the input video. For very fast object detectors (i.e., color thresholding and Haar cascades) having to run the detector on every input frame is likely not an issue. But if you are (1) using a significantly more computationally expensive object detector such as HOG + Linear SVM or deep learning-based detectors on (2) a resource-constrained device, your frame processing pipeline will slow down tremendously as you will be spending the entire pipeline running a very slow detector. The second drawback is related to the underlying assumptions of the centroid tracking algorithm itself — centroids must lie close together between subsequent frames. This assumption typically holds, but keep in mind we are representing our 3D world with 2D frames — what happens when an object overlaps with another one? The answer is that object ID switching could occur. If two or more objects overlap each other to the point where their centroids intersect and instead have the minimum distance to the other respective object, the algorithm may (unknowingly) swap the object ID. It’s important to understand that the overlapping/occluded object problem is not specific to centroid tracking — it happens for many other object trackers as well, including advanced ones. However, the problem is more pronounced with centroid tracking as we relying strictly on the Euclidean distances between centroids and no additional metrics, heuristics, or learned patterns. As long as you keep these assumptions and limitations in mind when using centroid tracking the algorithm will work wonderfully for you. In today’s blog post you learned how to perform simple object tracking with OpenCV using an algorithm called centroid tracking. Accepting bounding box coordinates for each object in every frame (presumably by some object detector). Computing the Euclidean distance between the centroids of the input bounding boxes and the centroids of existing objects that we already have examined. Updating the tracked object centroids to their new centroid locations based on the new centroid with the smallest Euclidean distance. And if necessary, marking objects as either “disappeared” or deregistering them completely. It requires that we run an object detector for each frame of the video — if your object detector is computationally expensive to run you would not want to utilize this method. It does not handle overlapping objects well and due to the nature of the Euclidean distance between centroids, it’s actually possible for our centroids to “swap IDs” which is far from ideal. Despite its downsides, centroid tracking can be used in quite a few object tracking applications provided (1) your environment is somewhat controlled and you don’t have to worry about potentially overlapping objects and (2) your object detector itself can be run in real-time. If you enjoyed today’s blog post, be sure to download the code using the form below. I’ll be back next week with another object tracking tutorial! I am going to implement it soon and see how it goes. Also, opencv released this tracker just for the info, you may already know about it. I haven’t had any time to play around with GOTURN yet. When I do I’ll be writing a dedicated blog post. hey Is the rects variable constantly growing in this code? Can you be a bit more specific regarding your question? i tried with GOTURN in opencv 3.4, but speed is very slow in cpu of mylaptop, my precision don’t good as use median flow tracker!!! Hi Adrian, big fan of your blog, you do an awesome job. I guess it’s also possible to use your code for other than faces tracking (let say dogs or cat). do you know to get that working. You would swap out the face detector and utilize your own object detector. This post will help you get started. Otherwise, you will want to wait until next week where I’ll have a specific example of using a different object detector (such as a dog or cat one). Are you don with the code to detect cars? I’ll be covering it in my upcoming Computer Vision + Raspberry Pi book. Make sure you’re on the PyImageSearch newsletter to be notified when it’s released! thank you for your time and effort Adrian! Thank you for your blogs adrian, I enjoy reading them. Looking forward for the next blogs. Thank you again. I am getting a lot of help!! Can I use your code in my APP ?? Thanks, Adrian for this post. I want to use your blog to track fish. How do you train fish detectors? I would suggest starting with this post on deep learning object detection fundamentals. That guide will get you going in the right direction. Adrian, thank you very much for the sharing. I really learned a lot from this post. I have a question about the occlusion solution. What is the mechanism of solving occlusion problem while tracking? Is that similar as Kalman Filter or something? There is no true “solution” to occlusion. There are methods and heuristics that we can apply (based on the project specifications) that can help with occlusion but there is no one true “solution” to occlusion. Thank you for another great tutorial, Adrian. I have only used Haar + Adaboost in the past(around 2011 or 2012) for face detection. What I remember is 1) it was super fast, but 2) it accepts a lot of false positives. So, in my natural thought, the vanilla implementation of Adaboost can hardly be used for the tracking system, am I right? Otherwise, the centroid tracking seems to be much promising for this purpose. One thing I wonder is that how robust is the centroid tracking when the object moves fast? Haar cascades are face detectors, they are not object trackers. You use Haar cascades to compute the bounding box of a face, then the resulting centroid, and then finally pass that info to your object tracker. That said, you are correct that if your detector is not accurate than you cannot expect the tracker to be accurate as well. The detector must be working accurately — that is why I choose to use a more accurate deep learning-based object detector in this post. I may have find an error in your code. If I initialize the CentroidTracker() class with a lower maxDisappeared (10 for example) I end up with this error in line 40 of centroidtracker.py : “RuntimeError: OrderedDict mutated during iteration”. I am looking forward for your blog post in this series, keep going you rock! “RuntimeError: OrderedDict mutated during iteration”. Such a project (especially if implementable on a raspberry Pi) has enormous utility. You could even make and sell a ‘people counter’ ! Knowing how many people enter and leave a building, a museum (or museum wing), a graduation a theme park adds significant security in addition to providing useful information to improve facilities. Forgive me if this is not the right place to post this but I did not find your forums on this site. But perhaps that’s intentional-when would you find time to moderate forums?! Hey Stefan — I’ll actually be covering “people counting” later in this series of blog posts. Stay tuned as I believe the implementation I’ll be sharing will help you solve your project. Outside of the actual blog posts go, you should take a look at the PyImageSearch Gurus course which includes a dedicated, private community forums. Please have a look at optical flow (Dense) and you will find a better and robust solution of your problem. Though if using moving/shaky camera to record then don’t forgot to stabilize the video using template matching before applying optical flow as flow could give an wrong information in case of relative motion due to the motion of the camera. Trust me result would be mind blowing. also i cant figure out which of the files is for the MODEL section. If you are new to command line arguments that’s okay, but you’ll want to read this tutorial on command line arguments first. Thanks for the awesome post Adrian. You are correct, thank you for reporting this typo — it’s now been fixed. Hey Navaneeth, I will consider doing a blog post dedicated to OpenFace but I cannot guarantee if/when that may be. As far as your project goes, if the face is being incorrectly identified you should spend more time playing with the parameters to the “face_recognition” library, in particular the distance parameters, to help reduce incorrect classifications. You may also want to look into fine-tuning the network as well. What about using the hardware to reduce the CPU processing? If you can only do a full search and identify in a fraction of the frames, the faces or objects could be tracked if you have MPEG encoding of all the video. MPEG only sends a fraction of the frames and then vectors saying how bits should be moved around to recreate the following frames. Calculating those vectors is highly efficiently coded or even available in hardware. Eg. you can pay extra for a code number to uncriple the hardware encoders in the PI. which gives Python code to get the vectors from a PIcam. You could certainly develop heuristics and assumptions as well to help reduce computational burden. But keep in mind that those assumptions may only be relevant to a specific project and may not be able to be used across all projects. Secondly, deep learning-based object detectors included an “objectness” component that quickly determines which areas of the image warrant additional computation, including applying the object detector. They are still slower (but more accurate) than your traditional Haar cascades but they yield higher accuracy as well. As hardware progresses in the future these models will run faster. very good tutorial, we have implemented an object counter using deep learning to identify the object and using OpenCV an algorithm to perform the count. It’s pretty slow, we’ll try this method to improve the speed. Hey Christian — congrats on implementing a successful project! As far as deep learning goes, have you tried pushing the inference to the GPU? That would speedup the pipeline. I am happy that you are enjoying the free blog posts Amir. It’s wonderful to have you as part are of the PyImageSearch family 🙂 Keep learning from them! HI Adrian, your blog is totally awesome! Prior to stumbling upon your site, using an RPI and a windows pc I was able to create a robotic camera which streams wirelessy (almost no latency) and is able to be aimed via servos and the arrow controls on the laptop. Moving forward, I want to add object tracking as it applies to human entities. I recently received this blog and I thought that it would be a good jump off point for the upgrades. WIth that said, I am curious as to whether you have blogged about implementing the face detector (or a general human detector) and where it can be found? Thus far, the RPI is a streaming slave and the majority of the heavy lifting is done on the laptop. On that note, the computational resources are limited… so I am really hoping there is an efficient algorithm/implementation that already exists. I would appreciate any advice you can provide. I actually have blog posts dedicated to both topics. See this post on face detection along with this post on general object detection, including person detection. You can find the first of the more advanced methods in this post. Stay tuned for more object tracking posts coming soon! However, one thing I couldn’t figure out was what the indices of the “detections” are: e.g. detections[0, 0, i, 3:7]. I get that i is the iterator, and 3:7 apparently give the bounding box coordinates, but what data type is this, and what other things are there? I couldn’t figure it out online – not even sure what data structure I’m looking at (net? forward?). Unfortunately the OpenCV documentation can sometimes be confusing [it’s actually usually a bit easier for C++]. 1. The “detections” variable is a bit hard to fully understand. I don’t have a fully-documented example on it (I’ll consider it for the future) but for the time being be sure to refer to my source code on examples of how to extract the bounding box coordinates, labels, and corresponding probabilities. 2. I don’t officially support Windows here on the PyImageSearch blog. You are more than welcome to use whatever OS you feel more comfortable with. In general, I’ve found that most readers struggle significantly more with Windows than Ubuntu or macOS for computer vision or deep learning. from old times i remember there was a windows application called flutter and it was a simple detection of hand poses to play or stop music or going left or right. that idea was bugging me for so long cause i was a kid but now i am aware of what was happening back there. my struggle is to write a code to detect and track hand in a frame video which is from my web cam and then use it as a mouse. like moving around and clicking. the problem is i know the whole story like i have been coding it with a haar and kalman filter to follow it and simply move the mouse too but clicking and other stuffs are the hard part. Just so I understand correctly — you are able to track the hand via Haar cascades and Kalman filters but you need a suggestion for the GUI interaction library? I don’t have a ton of experience in that area but I really like pyautogui. there are several ways to do it but my code was to get the resolution of the screen and adapt the point i am showing ,to follow like a point in the middle of the rectangle as (x,y) of the web camera feed and get the simulated point on another resolution, so that i could be covering the wider screens dynamically. Haar cascades are fairly prone to false positives. HOG + Linear SVM detectors are more accurate as are deep learning-based object detectors. I would swap out your Haar cascades for one of those and see how far that gets you. Thank you for this awesome project.I wanted to ask you like there are moments when people usually are engaged in mobile and hence there head is tilted down most of the time.I have used same face detector which you have used.The problem is that with little head tilted straight down it is not able to detect the face.Can you please suggest me how to overcome this problem? P.S:- Have been following you since long like for me you are god of CV.Thank you. Hey Sanjay, thank you for the kind words, I appreciate it. As far as the head titling, I assume by the “same model I’m using” you are referring to the deep learning face detector? If so, the model should be able to handle slight head tilts, but if the head is tilted too much it won’t work. You may want to consider training a face detector on head tilted images. Secondly, the dlib library includes another deep learning-based face detector. You may want to give it a try and see if it gives you better detection accuracy. An example of how to use it can be found in this post. Hey How to Implement on Keras base tensorflow lib. Hm, you don’t need either Keras or TensorFlow for this example. What specific functionality do you want Keras/TensorFlow for? Currently I am running tracking on CPU using opencv dnn face detector.It misses slightly bounding box in some frame.My Question is If i shift to GPU does it make detection in every frame better? Also Is there any relation with distance the object is standing from the camera? Also does result changes if the object is standing on left or right side of the frame? Running inference on the GPU will make the predictions faster, but not more accurate. Right or left side of the frame won’t matter but typically objects closer to the camera are easier to detect. Nice article, enjoyed reading it as usual. I used the centroid tracking algorithm with YOLO face detector and it works fine. Thank you Adrian. Hi, Can you tell me how did you implement it to YOLO. Thanks. Take a look at my YOLO object detection tutorial to get started. Can we define detection distance?For example it detects people at particular distance only or object that are more closer to camera? Absolutely, but you would need the modify the code to perform that action. A general rule is that smaller objects are farther away and larger objects are closer to the camera. Combined with this code you can determine in which direction they are moving as well. You can calculate the area of the rectangle using the coordinates. The faces that are close to the camera will have larger area than those faces which are far away. Thank you for your replies above. I want to share concern regarding object detection.When i try to detect from the recorded video in afternoon it is not able to detect people because of sunlight issue i think so and it is able to detect people at night. How do i resolve this issue? What type of object detector are you using? The same which is used in this article.I even tried dlib and LBP and other detector as well even they are failing badly but then i found RetinaNet and it is able to detect quite awesomely.Can you tell me how can i convert any object detection model into tracking? Object detection and object tracking are two totally different algorithms. You perform object detection and then object tracking. This tutorial demonstrates how to perform the entire pipeline. Thank you, Adrian. Can you tell me how can I do object tracking on mobile? Is there any tutorial where you have explained to do object detection or tracking on android mobile? You will need to port the code to Java + Android. OpenCV provides Java/Android bindings but I’m not familiar with them. You’ll need to refer to the documentation. If I wanted to track the person with the lowest ID number to print out their pixel coordinates on the screen, how would I go about that? Also, What parts of the centroid tracker would I need to update if I wanted to implement a Z (depth) axis from an IR depth camera? This code assumes you’re working with a standard RGB image without any depth information. Adding depth information would require quite the overhaul and is honestly too far outside the context of this tutorial — it would require it’s own dedicated tutorial. Secondly, Line 73 starts a “for” loop that contains the (x, y)-coordinates for each object. You can sort the “objects” dictionary based on the object ID and then show only the object information with the smallest ID. Thanks for the quick reply Adrian. I will try what you have suggested. I have been working on a personal project successfully implementing a depth camera IR stream which is masked to the RGB stream. I was hoping to modify your code to implement the third depth axis found at the centroid location to give greater accuracy to the Euclidean distance mapping to prevent detection ID crossovers, but by the sounds of it, its likely out of my league. 1. The part “detection = net.forward()” – what exactly does this forward function return? I tried printing it to find out, got an array of float values. I want to know what these values correspond to. The code logically looks fine, is this a run-time error? 3. Is this code compatible only with the Caffe model? Can this code be tried with the Darknet YOLO configuration as well, or does it need some modifications? 1. The detections is a NumPy array. It returns potential bounding box coordinates and their corresponding probabilities. 2. It looks like a run-time error of some sort. Make sure you’re using the “Downloads” section of the blog post to download the source code and models. You may have accidentally introduced a bug when copying and pasting. 3. It would need some modifications. I’ll try to do a YOLO tutorial in the future. Would try to modify and make it YOLO consistent and share the results. hi dear Adrian. thanks for nice blog post. really good. do something…… but this do for every face. Keep in mind that we’re just performing object tracking in this blog post, we’re not performing face recognition. I would suggest you read this post on face recognition before continuing. The for loop on Line 73 allows you to associate the object ID with the bounding box. Thank you for this great post. What camera (or webcame) did you use in this post? I want to buy one to get into Computer Vision. It was actually the builtin webcam on my iMac. Can your model work if we give object to track in first frame (give bounding box in first frame) only? Yes, provided that the object is visible in the remaining frames and the first frame is a good representation of what the object looks like. The model definition wants an input of (1, 3, 300, 300) as numpy shape. Why is the image taken from the video stream rescaled to a width of 400 ? In a previous blog post about face detection with the same network the images were scaled to 300×300 pixels. Hi Adrian, Do you have this implemented in C++??? Sorry, no, I only provide Python code here on PyImageSearch. Yes, of course. You will use your Haar cascade to detect the bounding box coordinates of the face. From there, pass in the bounding box coordinates to the KCF tracker. From there the face will be tracked. I modified the code slightly as to not require imutils.video import VideoStream and instead just use cv2.VideoCapture(0). It works perfectly; however, it is really laggy by way of frame rate. Is this why imutils.video was used in this instance? The process now consumes approximately 60% cpu… which is enough, but the needle isn’t pegged. Unfortunately I am running a laptop, that uses an AMD gpu so this could play a factor, but considering that the library is already trained that seemingly shouldn’t play into it. Using haar-cascade, I have zero lag on my frame rate, using cv2.VideoCapture(), and my cpu usage is actually higher. The haar version of face detect will consume about 2/3 less cpu, and detect face much better. Previously it was at ~75% cpu and it now runs at approximately 20% cpu. The reason we use the imutils “VideoStream” class rather than OpenCV’s “cv2.VideoCapture” function is because VideoStream is threaded and is much faster. A separate thread is used to increase the throughput rate of the pipeline. You can read more about the speedup in this post. Can you help me implement this using Haar cascade? Can you please tell me how can I detect something in real time with a sample object. Like, I want to detect a pen from a collection of pens that matches my sample pen. So, given an image that contains N pens you want to find one specific pen? How is that particular pen unique? Is it color? Shape? I’ve used this code for a project of mine (would be giving credits in the acknowledgement). I am running into an issue – my project deals with detecting objects and tracking them within a certain ROI, beyond which it should stop tracking. Now when the object goes out of the ROI box, the detection as well as the tracking stops but the ID number stays on screen. Now, I understood the point that the entry for the particular ID number in the Ordered Dictionary will be there for atmost n number of frames defined in the variable maxDisappeared. Currently, it is set to 10. But in spite of crossing the 10 frame limit, the entry stays in the DIctionary and doesn’t get deregistered till a new object gets added in the dictionary. Only then the previous ID gets deleted. I assumed this was a minor issue, but now if I introduce a new object even after 70-80 frames, the last ID stays in the Dictionary. The ID assignment code is completely same as mentioned here, I did not make any changes to it. Hey Barry — just to clarify which dictionary object are you referring to? We use quite a few dictionaries in the code so I want to make sure we’re on the same page. Could you point to a specific line(s) number? My OpenCV People Counter tutorial can easily be extended to vehicle counting by changing the class label that is detected. Thank you very much for the post Adrian! Are you also writing a post on object tracking without detection in every frame? What I mean to say is, in the method above, you are detecting the object(s) to be tracked in every frame. As you might know, there are methods where a discriminative classifier is used to calculate the confidence scores for each patch around a location to predict the object’s location in the current frame and also to update the classifier for the next frame. It would be nice to have a tutorial on this approach as well. I actually wrote a blog post that covers the hybrid approach of intermittent object detection mixed with tracking. You can find it here. Hey Adrian ! Nice work! Can we use this code for videos that are already available instead of a real time video? Also how can i modify this code for vehicle tracking ?? Thanks in advance . Cheers! Yes, you can use this code for existing videos. Just use the cv2.VideoCapture function. Hey Adrian, what a excellent work you have put here. I am super new in programming. Currently I m using Haar cascade to detect cars. You mentioned that it can be implement using Haar cascade. Even after I have read Implementing the object tracking driver script also I can’t figure out what to change. Is there any solution? adrian how we can save the bounding box coordinates.? You mean save them to disk? I would suggest you look into basic Python file I/O before continuing. If you want to use a database you should refer to the documentation for whatever database software you are using. Humble request, if you can write a similar blog for OBject tracking for YOLO (Darknet).As this blog uses Cafffe framework only. I actually already have a tutorial on YOLO. You can learn how to combine deep learning object detectors with object tracking in this tutorial. This is my first time working with image processing, I have downloaded the open CV from the example and have done the pip install the get the numpy imutil and scipy, however i would get a error in the terminal from the downloaded code which would not recognise the module name of the imulit, scipy. Any suggestion or instructions on what to do with the downloaded files after from the email and where should I place them?? Hey Jonathan, how did you install OpenCV, NumPy, and SciPy? Did you use the install tutorials I use here on the PyImageSearch blog? Or did you use a different set of instructions? Use the “Downloads” section of this tutorial to download the source code, including the “pyimagesearch” module. Hi Adrian, Thanks for the tutuorial. Do you know what happens, when one objects leaves and one arrives between frames? Example 3 objects, one appears left, one stays in the middle (id=1), one leaves right (id=2). Will the middle object get id=2 and the one that appears id=1? How to calculate time duration for particular objects which are being track? Thanks for your wonderful blog. Has been following your blog for quite a while. My project will be working on application of passenger counting by counting face to obtain passenger count, age and gender in a bus. I will be using a few Movidius NCS stick to perform genderage net on the edge. Problem I encountered is having the NCS redundantly counting the same face as different input. Hence, I try to figure out to use this blogpost’s code to solve the problem. Could it be possible to extract the face (in the rectangular box perhaps?) according to the ID in your code and proceed my application based on the individual ID box to reach my end goal? Hey Rick — do you have any example images of the NCS redundantly counting the same face? I’d like to see what’s going on before providing a suggestion. In the ncappzoo/apps/ gender_age_lbp (https://github.com/movidius/ncappzoo/tree/master/caffe/GenderNet) I made small edit on the C++ in cpp folder titled gender_age_lbp.cpp on line 643 I’ve output the variable “rectangle_text” into a csv folder for me to do the analysis on passengers’ gender and age. Once I run the application, it will redundantly giving me inference on the same faces which is not what I want for my project. It would be good if I can extract the face according to their ID# (so it is not redundant) in this blog as there’s a NCS python code that can do inference on image stored at local storage. (in ncappzoo/caffe/gendernet/run.py). My question is a bit long. Sincerely appreciate for your time. Hey Rick! Hats off to you for digging into the C++ code in GenderNet for Movidius. This isn’t actually something I’ve done, but it might make for a good future blog post — has anyone on the Movidius forums been helpful? Are you using both the NCS v2 and the NCS API v2? Your work and the explanations are really awesome. As an extension to this post can you tell me how can we detect an object which is there in the frame for more than specified number of frames at the same location. For example if you stay in the same position for 30 frames then we need to put a text that says Andrian is stayed in that region since one second without moving. How can we do that. You can do that via object tracking. This tutorial will help you get started. If you’re interested in the object trackers built into OpenCV then I would suggest following this tutorial. Thanks for your work Adrian. You are awesome! Hi, Do you have any tips on improving the frame rates if I implement this on a Raspberry Pi? Much of the computation is spent on the face detector. Try using a Haar cascade. Hi Adrian, its me again. I would love to know how can you implement this object tracker like what you did on laptop webcam into Raspberry Pi Zero W. I have change line 34 into vs = VideoStream(usePiCamera=True).start() [as stated in https://www.pyimagesearch.com/2018/06/25/raspberry-pi-face-recognition/%5D to use my Raspberry Pi Camera instead of webcam. However it couldn’t work directly as desired. Since I am accessing to my RPi Zero W using SSH, I could not know what error I have into while I’m running the python code of object_tracker.py. It only shows “Illegal instruction” in the terminal. So, I tried printing a simple sentence of every line to see which line that has error have from my finding its at line 41 (frame = imutils.resize(frame, width=400)) that fails to print my simple sentence after this line. However I could not figure out what’s the error of this line. Could you help about it? Or did I left out something else? For whatever reason the Raspberry Pi Zero + OpenCV hates the default inter=cv2.INTER_AREA to imutils.resize. The code works, however, is there any other possible to solution to stop the camera from streaming? As I am doing SSH to the RPi Zero and I could only stop the camera by CTRL + Z and the camera is still running (red LED still on). As compared to webcam we have the frame window pops out and can be stopped by press ‘Q’. Sorry for asking such question. It is resolved by just pressing CTRL + C. Though some patience is needed for it to stop. Out of curiosity, were you performing X11 forwarding via SSH? thx for the great article. quick question for the distance calculation/ordering. the final result would be the same except that the centroids would not be ordered by distance. In this case I assume the ordering is not really important. Hi Adrian, thanks once again for your awesomely explained tutorials. I would like to ask about some implementable tips that you can give away. Since this project utilizes CPU, in videos or (in real time scenarios), fps is less than normally expected – 30 fps. And every time the program is run, fps value is different as well. Therefore, could you give your thoughts on how one can solve this issue? Is it possible to set fixed frame rate? If yes, then wouldn’t it be erroneous when program can’t receive fixed number of frames due to PC specs? Maybe multi-threading is possibly another workaround?! What do you think? Massive thanks for your time! i’m using Windows 7 and python 3.7. what should i do? Your error is coming from not understanding how command line arguments work. Read this tutorial and you will be able to successfully execute the code. I hope you will reply as soon as possible.Thanks for the help. It sounds like you’re using an old version of OpenCV. You need at least OpenCV 3.3 for this tutorial. Make sure you follow one of my OpenCV install guides. Your path to the input “deploy.prototxt” file is incorrect. Double-check your input file path. Any idea on why ssd with resnet from the TensorFlow Model Zoo is so much slower than the caffe detector you are applying here ? Is it a different model ? Yes, it’s a different model. See this tutorial for more information on the face detector. Has anyone else run into this issue? I’m just using a picamera plugged into it’s corresponding port… nothing crazy but for some reason it’s not reading it for VideoStream???? I found a bug. In centroidtracker.py line 48 you mutate an array while iterating over it. I changed your code to track what needed to be removed then when done with the for loop I remove the correct items. After that I was able to run completely through a Friends episode. im getting the same error. how did you solve that? i wanted to do it using tensor flow with faster rccn model can you please help me how i can do the same process using tensor flow frozen inference graph which i produced for the face detection after training. i am getting pretty good result so i want to implement this to tensorflow. Your work and the explanations are really awesome. As an extension to this post can you help me out with saving the video as a .avi or .mp4 file. You’ll want to refer to this tutorial first followed by this one. I want to extract only the faces of a person using Raspberry and Movidius. Is there any way to only extract the ROI of the tracked image using Movidius on Raspberry Pi? I have followed “Real-time object detection on the Raspberry Pi with the Movidius NCS” and that can provide very robust FPS on Raspberry but doesn’t give me the ROI I want as this blog as that final output is keep detecting same faces as multiple result. Are you asking how to perform face detection with the Movidius NCS? If so, I’ll be covering that exact topic in my upcoming Computer Vision + Raspberry Pi book. Stay tuned! Yes face detection and taking snapshot of the bounding box (ROI) with only single output for a same person, just like how it can be done through this blog ‘Simple object tracking with OpenCV’. Unlike workspace/ncappzoo/apps/security-cam/security-cam.py, it take multiple snapshots of same person. My goal is to do passenger counting by extracting the face only as ROI and not multiple snapshot of same person, and then feed these snapshot into gendernet and agenet for age and gender classification. Hey Rick — I don’t have any examples of running a face detector using the Movidius NCS on the PyImageSearch blog but I’ve made a note to cover it in my upcoming Computer Vision + Raspberry Pi book. Thank you for the suggestion, I’ll make sure it’s covered! Is it possible to optimize this code by running object detection for a certain interval of frame instead of running the object detector for every frame? By the way, thank you so much for such a helpful tutorial. Yes, absolutely. See this tutorial as an example of doing exactly that. Hi, is there a maximum distance which the input and previous centroids will not associate? Or as long as there is one input and one previous centroid will it always update vs increment the disappeared counter? Thank you for the nice tutorial! This particular implementation does not have a max distance for association but the one I’m including in my upcoming Computer Vision + Raspberry Pi book will have a max distance. Hi Adrian! thanks a lot for your dedication. How can I implement this object tracking but using a contour detection instead of deeplearning?. I want to track a green rectangle. Whether or not you can use contour detection is dependent on your ability to segment the object from the image using contours. You can use contour tracking here though, just pass in the bounding box of each individual contour. How can I use Haar cascade classifier instead of .prototxt and .caffemodel? Have you used a Haar cascade before? If not, refer to Practical Python and OpenCV where I teach you how to use them. Once you understand how to use Haar cascades you’ll be able to swap them in place of the deep learning models. TensorFlow models to do what, specifically? However, I have a little issue. Once an object is marked for tracking and I start the tracking algorithm it works fine. But after few frames, if I want to pause the video and select another object for tracking in the same video, I am unable to track this newly marked object of interest. What can be the issue here? Can you please provide some explanation? This is some issue like when tracking is started, I cannot select another object. I have to stop the algorithm altogether to track the the aforementioned object.